On one of their five trips to Chattanooga while scouting the city as a possible place to retire, Doug and Mimi Hedwig attended an opera at the local campus of the University of Tennessee. After the performance, a woman in the row behind them openly admired Ms. Hedwig’s Turkish shawl, and the two women struck up a conversation. The Hedwigs left with an invitation to tea at their new friend’s home. A steady stream of retirees are finding their way to the Scenic City, Chattanooga’s official nickname. The scenery is indeed a big part of the lure, but people don’t just look at it. 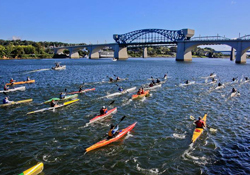 The town sits on the Tennessee River in the southern reaches of the Appalachian Mountains, an area that offers plentiful opportunities for boating, hiking and cycling. Other selling points include mild winters, a solid economy, a low cost of living and an array of cultural offerings. Newcomers also cite the city’s proximity to several interstate highways, which creates easy access for grown children and grandchildren to visit. The downsides? Summer heat and humidity. High pollen counts, especially in the spring. Seemingly endless construction on those interstates. And many affluent residents, dissatisfied with the quality of public education, send their children to private schools. Still, the population is growing steadily, and older transplants are playing a part. Realtor Gail Hunter says she is selling an increasing number of homes—from $150,000 one-level bungalows to $500,000 luxury condos—to relocating buyers over 55. Some opt for sprawling houses on the river or Chickamauga Lake; others prefer urban townhomes with views of nearby Lookout and Signal mountains and easy access to farmers markets, cultural events and restaurants. Chattanooga long ago found itself a national story—for all the wrong reasons. In the late 1960s, thick industrial smog prompted CBS anchor Walter Cronkite to dub it “America’s dirtiest city.” At the same time, decay had set in downtown. In response, the city tightened environmental rules on factories and held brainstorming sessions on reviving the downtown area. In 1992, the Tennessee Aquarium opened on the downtown riverbank, sparking a $120 million waterfront transformation and a ripple of development projects funded through public-private partnerships. Free electric buses now shuttle visitors along the downtown corridor (though public transportation elsewhere can be hard to find). Like many retirees, the Hedwigs moved here to be closer to family. But that wasn’t the only draw. Mr. Hedwig, 64, a retired Brooklyn College music professor and trumpet player for the Metropolitan Opera orchestra, and Ms. Hedwig, a former book and magazine editor, wanted a city with a quality orchestra, an “intellectual, artistic and creative” university environment and, for good measure, a minor-league baseball team. 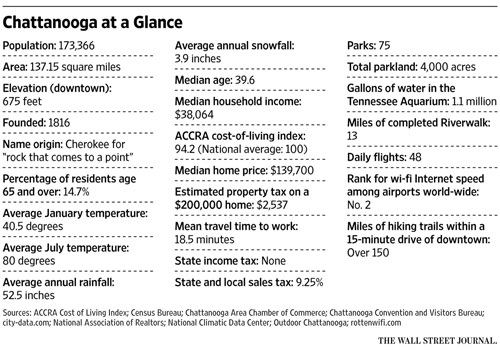 The ACCRA cost-of-living index ranks housing costs in Chattanooga at 87.1, well below the national average of 100. Annual property taxes on a home with an assessed value of $200,000 are $2,537 in the city and about half that outside the city limits in Hamilton County. There is no state income tax, but the state does have a 9.25% sales tax. Like the Hedwigs, many Chattanooga transplants see the city’s thriving cultural scene as a major draw, with an art museum, symphony, ballet company and theater center funded in part by private foundations that also support creative startups, public sculpture exhibitions and summer music festivals like Riverbend and the free weekly Nightfall concerts. Mixed-media artist Jan Chenoweth, 70, and her sculptor husband Roger Halligan, 67, were already considering moving to Chattanooga when a young artist friend mentioned ArtsMove Chattanooga, a program offering housing incentives to artists willing to move to the not-yet-revitalized Main Street district. The pair settled in the city in 2007 and were quickly embraced by the arts community. “There’s a sense of helping one another,” says Ms. Chenoweth of the camaraderie among local artists. But the city does lack a strong gallery scene. “Artists here expect their art to be going out to other places,” she says. Beth Harrell, 59, and her husband Mike, 61, were tired of living in “transient” Clearwater, Fla., and were ready to downsize and be closer to their aging parents in northern Georgia. On a trip to visit their daughter at Covenant College on Lookout Mountain, “we sensed something really special going on in Chattanooga,” Ms. Harrell says. Ms. Harrell, an ad agency owner, and Mr. Harrell, a manufacturing executive, quit their jobs and bought a house on Lookout Mountain in 2005. He became a management consultant, and she started selling real estate. The flexibility of self-employment, and their new bungalow in North Chattanooga, allows them to mentor budding entrepreneurs and volunteer in the community. To request information about retiring in Chattanooga, click here.